Heat oven to 350°F. In 2-quart saucepan, melt butter over medium heat. Cook onion in butter, stirring occasionally, until tender. Stir in flour; cook until mixture is smooth and bubbly. Gradually add half-and-half, salt and pepper. Heat to boiling, stirring constantly, until thick. Remove from heat; stir in turkey, asparagus, mushrooms and wine. Separate dough into 8 triangles. Place dough in ungreased 9-inch pie plate in spoke pattern, with narrow tips overlapping rim of plate about 3 inches (see photo). Press dough in side and bottom to form crust. 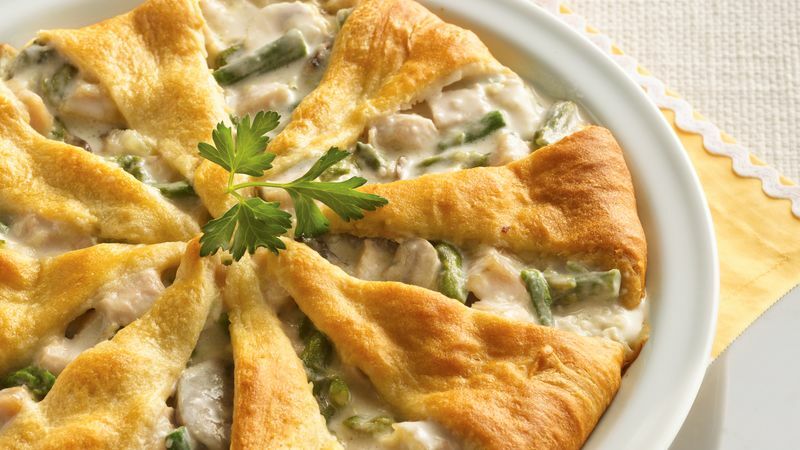 Spoon turkey mixture evenly over dough. Bring tips of dough over filling to meet in center; do not overlap. Bake 25 to 30 minutes or until golden brown. Garnish as desired. If substituting chicken broth for wine, omit the salt. 1 1/2 cups fresh cut asparagus can be substituted for the frozen.